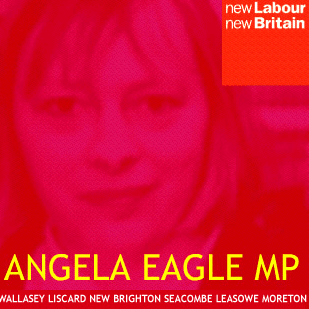 Angela has taken up a private members Bill on Equality which went through the House of Lords on 9th April 2003. It would create a Single framework for Equality law in the UK. The Equality Bill, which was sponsored by Lord Lester of Herne Hill, would extend, simplify and consolidate existing protections. It seeks to eliminate discrimination and promote equality between different people regardless of their racial or ethnic origin, religion or belief, gender, marital or family status, sexual orientation, gender reassignment, age or disability. It also contains powers to offer protection against harassment or victimisation and well as direct or indirect discrimination. If enacted, the Bill would be a long overdue modernisation of existing protections. Angela took up the Bill in the House of Commons and it received its purely technical first reading on 12th April 2003. It was down on the list to get a second reading on Friday 16th April but was objected to and so it got another chance on June 20th, July 4 and July 11. However, because it is so far down the list of private members bills it has no chance of being given a second reading. This does not mean that the Commons should not consider the principle of the Bill in other settings. The principle of moving to a Single Equality Act has an unarguable logic. Therefore Angela is looking for other ways of bringing this issue up in Parliament. Angela has championed an Early Day Motion (EDM) in the House of Commons calling on the Government to draft its own Bill along similar lines and enact it in this Parliament. By 9th of June she had gathered 245 signatures making this the seventh most signed EDM this session. Thirty years ago a previous Labour Government led the way in putting protections against discrimination on the grounds of gender and race onto the statute book. It was not until the 1990s that similar protections for millions of our fellow citizens who have disabilities followed. Yet, the law currently offers no protections whatsoever for those who are discriminated against because of their age, their religion or beliefs or their sexual orientation. Labour in Government has made progress in dealing with particularly blatant cases of discrimination in areas such as the age of consent for gay men and introducing the duty to promote equal opportunities on the grounds of race and ethnicity, following the inquiry into the murder of Stephen Lawrence. Labour was also instrumental in negotiating Article 13 of the Amsterdam Treaty of the European Union which extended the competence of the EU to cover discrimination. The two new directives passed to date under Article 13 on Race and Employment have extended employment protection across the European Union to all the six strands of discrimination. However, this protection does not extend to goods or services as in our own domestic anti discrimination law. Thus, without further legislative action it will be possible for an individual for example, to be refused service in a shop or access to a rented flat on the grounds of his or her age, belief or sexual orientation and this would be entirely legal. This seems very wrong. Simplifying and consolidating existing rights. It is well recognised by those who deal with current anti-discrimination law that it is badly in need of simplification and consolidation. Existing law is incoherent, piecemeal and complex. Incredibly, there is no generally standard to be applied in all cases of unjustifiable discrimination. Instead, requirements vary from one category of discrimination to another. The burdens of proof vary too, as indeed do the duties expected of employers. The application of European law has made the existing statutes unduly complex. This complexity makes it increasingly difficult for either employers or employees to know with certainty what their rights and responsibilities are. The existing law also fails to give adequate emphasis to the importance of prevention rather than redress after unfair discrimination has already occurred. The duty to promote fairness can drive organisational change in the workplace thus preventing discrimination happening in the first place and yet it currently only applies to racial discrimination and then only in the public sector. Clearly it should apply to all categories of discrimination and be extended to the private sector too. Lets stop lives being blighted by bigotry. There can be no sensible justification for excluding age, belief or sexual orientation from protection against unfair discrimination in goods and services. It is undoubtedly the case that some of our fellow citizens currently have their opportunities and life chances blighted by bigotry. It is about time we recognised their plight and acted to end it.